Gustavo Ferreira, Assistant Professor & Extension Economist, Department of Agricultural and Applied Economics, Virginia Tech. Peter Caffarelli, Research Assistant, Agricultural and Applied Economics Dept., Virginia Tech. The purpose of this article is to discuss grain transportation in the United States (U.S.) in terms of the final destination – domestic or international. This is a particularly important issue given that grain production and the food and feed industries are often geographically distant from each other. In the case of foreign markets, the logistical requirements become even more complex and a well-developed transportation system is needed. Grain relies on barge, rail, and truck to facilitate its movement within the U.S. This study uses data on grain transportation that has been gathered by the USDA Agricultural Marketing Service (AMS), and the period of analysis goes from 1978 to 2010. The first objective of this analysis is to identify general trends in overall grain transportation in the U.S. Figure 1 shows the total volume of grain transported in the U.S. in thousands of tons, and includes both exported and domestically consumed grain. The data reveals an important and continuous growth in volume of transported grain during the period of analysis. More specifically, there was a 116 percent increase in total tons from 1978 (237,994,000 tons) to 2010 (514,026,000 tons). Figure1. Total Transported U.S. Grain from 1978 to 2010 (in 1,000 tons). The next step includes the breakdown of total volume into five main grains: (1) corn, (2) wheat, (3) soybeans, (4) sorghum, and (5) barley. This breakdown allows for the identification of the shares of each grain and their own transportation trends. Figure 2 shows that the five selected grains followed a very similar pattern during this period, and their relative shares have remained fairly constant. Perhaps, the most significant changes are the gradual decrease in the share of transported wheat and increase in the share of corn and soybeans. Figure 2. 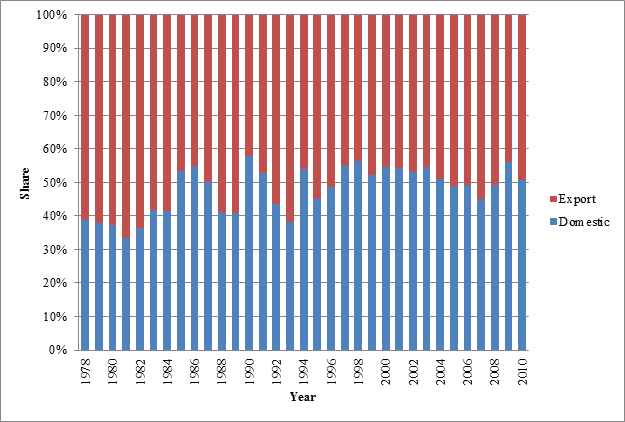 Transportation of Five U.S. Grains from 1978 to 2010 (in 1,000 tons). In order to identify trends in both domestic and international grain markets, it is important to assess how much of the grain is transported to domestic and export markets in the United States. As shown in figure 3, the increase in overall grain transportation (shown in figure 1) has been caused by a significant increase in the amount moved through domestic markets. Despite recurrent grain production fluctuations in the world market, the amount of U.S. grain transported for exports remained constant (slightly above 100,000,000 tons) over the past three decades. Figure 3. 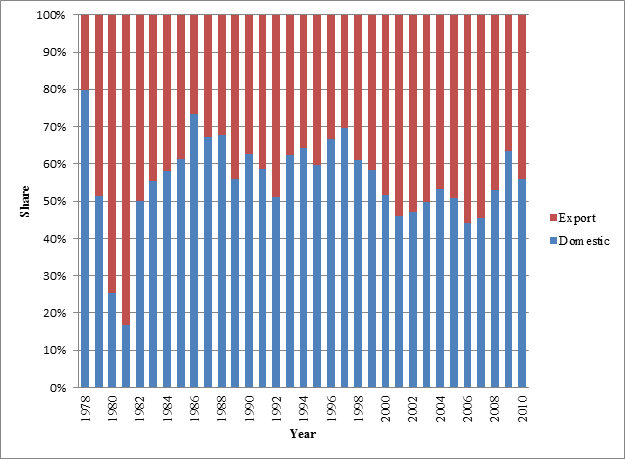 Transportation of U.S. Grains to Domestic and Export Markets from 1978 to 2010 (in 1,000 tons). The data are now analyzed in order to understand how the shares of transported grains – to domestic and international markets – may differ for each grain. 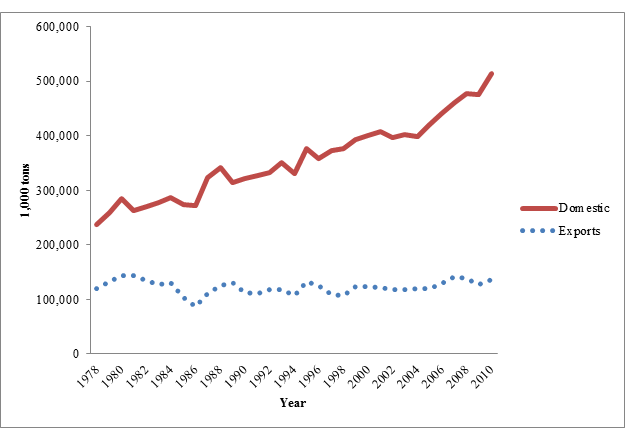 Starting with corn, figure 4 reveals that the share of corn that is moved to domestic markets has increased over time at the expense of that moved to markets with a final international destination. These trends support the idea of a growing domestic demand for corn (i.e. growing ethanol production) and a decrease of corn exports. Figure 4. 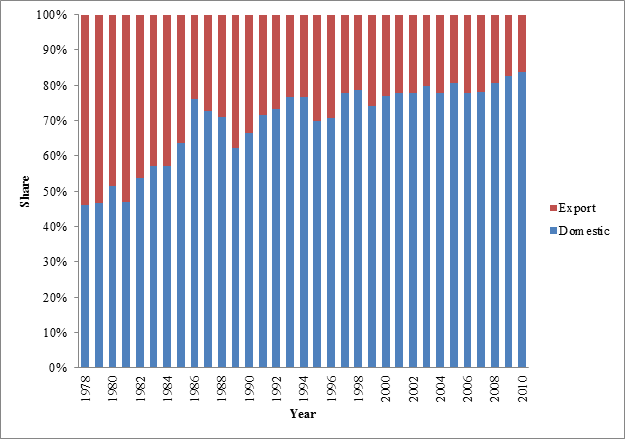 Transportation of Corn to Domestic and Export Markets from 1978 to 2010. The same analysis is now conducted for wheat, with the results shown in figure 5. 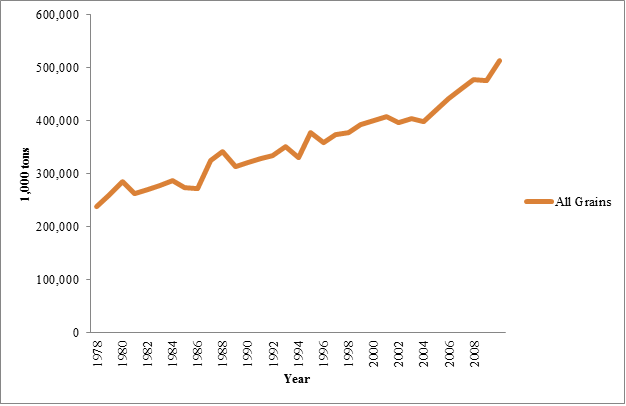 During the late 1970s and 1980s, the volume of wheat transported to export markets was slightly greater than the amount of wheat moved to domestic markets. Nevertheless, from the 1990s to 2010 the two shares have been remained evenly distributed. That is, for the past twenty years, approximately half of the wheat transported has had a domestic destination, while the other half has been exported. Figure 5. 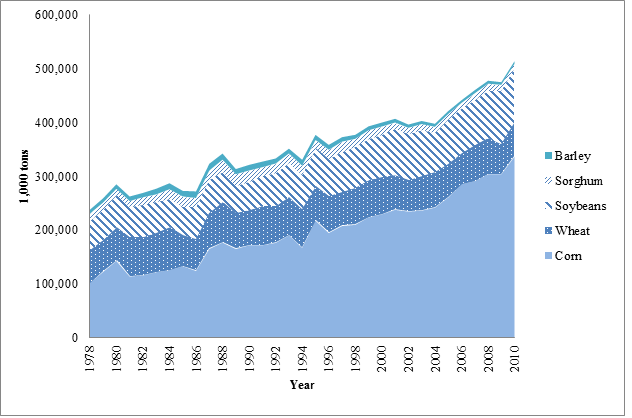 Transportation of Wheat to Domestic and Export Markets from 1978 to 2010. The end-destination shares for the transportation of soybeans produced in the U.S. are shown in figure 6. For this crop, the shares have remained fairly constant over the period of analysis. Around 60 percent of transported soybeans have had a domestic destination. It is worth noting the increase of soybeans transported to export markets from 2006 to 2010. Future data may confirm whether this is a long-term shift towards export markets or a short-lived variation in the soybeans market. Figure 6. 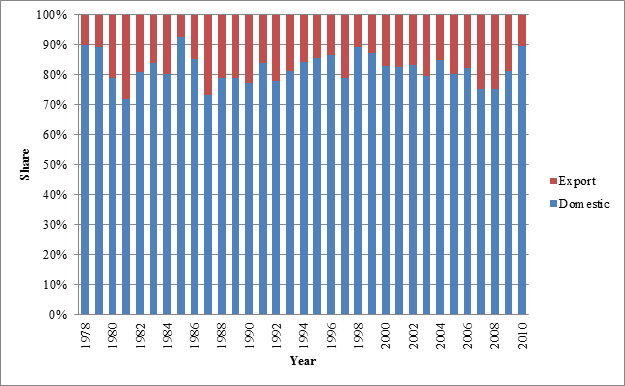 Transportation of Soybeans to Domestic and Export Markets from 1978 to 2010 (in 1,000 tons). In the case of sorghum, the transportation shares have experienced significant changes over time. As shown in figure 7, in 1980 and 1981 most of the transported sorghum was exported. Notably, despite smaller market oscillations over time, between 50 and 60 percent of sorghum has been transported to domestic markets in subsequent years. Figure 7. Transportation of Sorghum to Domestic and Export Markets from 1978 to 2010. Finally, figure 8 shows that, for the past thirty years, around 80 percent of barley has been transported to U.S. markets where the grain stays. Most of the barley produced in the U.S. is consumed internally and only a small fraction is destined for international markets. Figure 8. 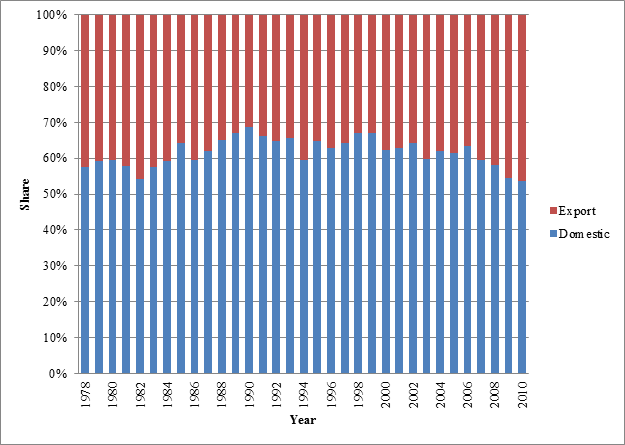 Transportation of Barley to Domestic and Export Markets from 1978 to 2010. The United States is the world’s top grain producer and an efficient grain transportation system is necessary to maintain low food costs for U.S. consumers and high market prices for U.S. producers. In a previous article Caffarelli et al. (2013) analyzed grain transportation in the United States. in terms of the different modal shares (truck, rail and barge) for individual crops. The current article focuses on the final destination of transported U.S. grain. The findings reveal that, with the exception of corn, the final destinations of U.S. produced grain has not changed significantly over the past three decades. Data show that most barley is moved to domestic markets while wheat is the grain with the largest share of movement to export markets. Caffarelli, P., Ferreira, G., Groover, G. and Kathryn Boys, 2013. “How Grain is Transported in the United States.” Farm Business Management Update (April-May Issue). Accessed on March 20th: http://www.pubs.ext.vt.edu/AAEC/AAEC-48/AAEC-48_PDF.pdf. This entry was posted in Articles and tagged Grain. Bookmark the permalink.